The joint opposition (JO) today requested President Maithripala Sirisena to remove Prime Minister Ranil Wikcremesinghe so as to ensure a free and fair trial on the Central Bank bond scam. Sri Lanka Podujana Peramuna (SLPP) Chairman G.L. Peiris told a media conference that the President was unable to take any practical measures as long as Mr. Wickremesinghe continued to function as Premier. “The Prime Minister's name was also mentioned in the bond report. 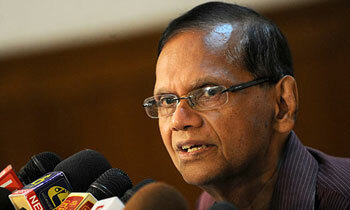 He said he will take the responsibility for appointing Arjuna Mahendran as the Central Bank Governor. It is the Premier who is behind this. President Sirisena says he will use the ‘sword’ irrespective of the status of the wrongdoers. He should first use it against the Prime Minister,” Prof. Peiris said. He said the ‘sword’ should be next used on the COPE members who are alleged to have had links with PTL owner Arjun Aloysius. Meanwhile, he said the convening of Parliament without publishing the Bond report was a useless exercise. Professor Sir- Were you able to talk like this when you were under MR. If there were Gentleman Politicians in the Parliament, he would have stepped down a long time ago. Fair call and comments from very unfair quarters. Now any muppet can speak against any body not like your era, enjoy the freedom ! But we know your past and the future ! .This old veteran gentleman just getting himself a joker,what a pity what a good education he had,but the Country never benefited. Useless rot. Okay will send present Prime Minster out of Parliament and will give that post to you. Satisfied ? You mean just like you all removed the former CJ? Why not retire now without creating more Parliamentary jokes.